The three microbial cushions were designed and produced for the One Rock exhibition at Welfare State International in December 2003. This local exhibition involved looking at the ecology and mythology of a rock in Morecambe Bay. I used my scientific background to create designs based on the ultrastructure of a bacterium and algae. This picture was created to illustrate the damage of a pier by fire. I used a technique learnt from Kate of Kate's Kloths, Blyth in which I trapped a variety of fabrics between organza and calico and then embellished with threads and stitches. 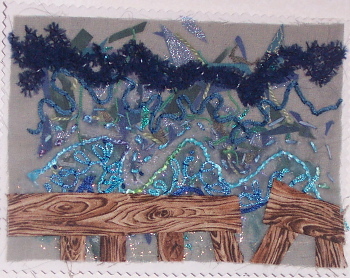 I then used free machine embroidery on cold water soluble fabric to produce the pier. This picture was created in a similar way to the Pier on Fire and was designed to show part of the pier ravaged by storm. 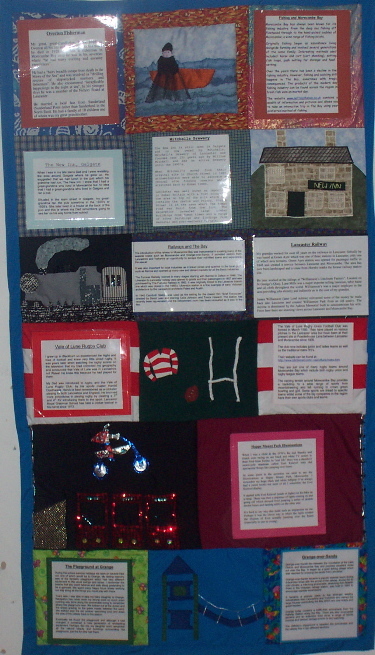 This wall hanging was created to help draw people's attention to the story-gathering phase in the Longline project at Welfare State International. I have illustrated 6 brief stories which are from each of 6 generations of my family who live or lives in or around Morecambe Bay. It illustrates some of the industries that they have worked in and some of the leisure pursuits. I laminated the stories and accompanying information and sewed this directly onto the wall hanging.